The Bank of England has so far FAILED to respond to high inflation by starting to raise interest rates, clearly the Bank of England is delaying any action on rates ahead of Government spending cuts and tax rises to total about £60 billion a year to be announced in a weeks time (though the government has tied one arm behind its back by ring fencing Britians sacred spending cow, the NHS). Therefore it is a case of the Bank of England hoping that inflation will not rocket higher. However in my opinion delaying interest rate hikes in the face of high inflation will result in even higher inflation and thus eventually even higher interest rates when the country reaches a crunch point that the market will force the governments hand by pushing bond prices significantly lower much as many European countries are experiencing. The only element missing from the equation so far is economic growth which I expect to surprise to the upside this year, whilst growth is yet to materialise in any official data it is however showing itself in higher tax revenues and thus a smaller budget deficit which is now more than £20 billion LESS than forecast barely 3 months ago. So as strong growth materialises we will start to see the focus at the Bank of England's monthly MPC meetings gradually shift from being uber dovish on interest rates to issuing hawkish statements to eventually near panic hawks as interest rates are sent sharply higher in a belated move to prevent sharply higher inflation from materialising. So at the end of the day UK growth and interest rates will be significantly higher a year from now, which will leave most of the pseudo / academic economists with egg on their face as they continue with the mantra of no or very little change in UK interest rates for several years. The illusion of deflation continues even more vocally in the United States mainstream media and BlogosFear, much as the mantra of the always imminent return of the stocks bear market at the end of every correction continues. Again the facts don't support the rhetoric as U.S. CPI continues to rise by more than 2% per annum instead of being negative by now as Deflationists were loudly proclaiming barely 6 months ago. Instead persistent perma deflationists conjure deflationary rabbits out of the hat such as the Gold divided by X ratio to imply deflation exists, anything other than refer to the the actual RISING inflation indices. Off course were U.S. CPI negative by now then the perma deflationists would be crowing loudly. As things stand U.S. CPI inflation is trending below the forecast path (Inflation Mega-trend Ebook), which is not so surprising given the strength of the U.S. Dollar during 2010. The weaker inflationary trend therefore projects towards a year end inflation rate of between 1% to 1.25% against the original forecast of 2.1%, which is still a far cry from outright deflation as seen during 2009. The stock market continues to trend inline with the last in depth analysis (16 May 2010 - Stocks Bull Market Hits Eurozone Debt Crisis Brick Wall, Forecast Into July 2010), with most recent price action seeing the Dow break out of its tightening range of between 10,300 and 9,800 which targets a trend to Dow 10,700+. The trend of the past 3 weeks has been accumulating ever louder bearish commentary and sentiment with the Perma crowd announcing with near certainty that April was the TOP !, Just as Jan 10 was before it, and Oct 09 before that and August 09 before that and April 09 before that. Overall expectations remain for the Dow to be stuck within a volatile upwards trend into Mid July 2010, as illustrated below. To date the correction has not done ANYTHING to suggest that it is anything other than correcting the preceding 13 month bull run, in fact in trend terms it is pretty close to the forecast run for the year as indicated by the below graph of the even BIGGER Picture from the Inflation Mega-trend Ebook over 4 months ago (FREE DOWNLOAD). 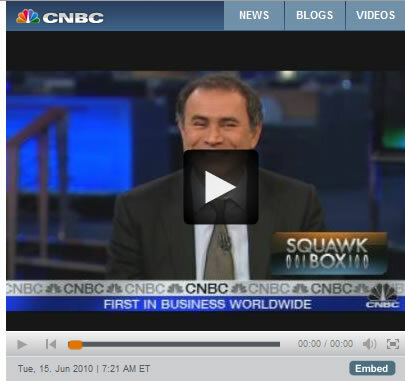 You know you've seen the bottom when you see Dr Doom Nouriel Roubini and PIMPCO Bond Pumper Mohammed El-Erian on CNBC, and if you see them both at the same time ? BUY, BUY, BUY !!! Your inflation mega-trend stocks bull market investing analyst. cash in after say 3 year term RPI is still 5.1 %, then your return iis the bonus only which is 1%. If this is correct then the real return is current RPI (5.1%) minus bonus (1%) = minus 4.1% return on this bond. The advisor does not make a penny from these certs in commission hence he has given you the WRONG ADVICE !!! He either does not know, ELSE deliberate MIS information either way should NOT be advising ANYONE! The certs are indexed on ANNIVERSARY. If there is deflation for that year i.e. RPI is NEGATIVE then you get 1% MINIMUM - YOU NEVER GET A MINUS RPI !!! Don't get confused by RPI index and RPI Inflation. Current RPI Inflation is 5.1% (annual change), RPI Index is 222 - see the graphs. If RPI is negative - i.e. deflation then you get 1% per year. YOU NEVER GET NEGATIVE RETURN. The rates are COMPOUND for multiple years. Also the limit is £15k per person per issue.